People don’t buy products, they buy → benefits that will improve their lives. Sell the benefit behind every new product or feature – and be very clear about it. 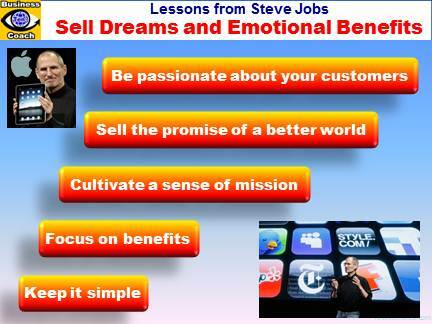 Steve Jobs was selling dreams and → emotional benefits, not products. He didn’t sell computers. He was selling the promise of a better world. When Jobs introduced the iPod, he didn’t see it as a music player, he saw it as a tool to fill people’s lives with music. He was driven by a messianic zeal to create new great experiences and help people stretch imagination. Passion, enthusiasm, and emotion are powerful ways to motivate others. Jobs’ passion and a sense of purpose far beyond the actual product set him and his company apart. Steve Jobs’ innovative presentation techniques turned the Apple CEO into one of the world’s most extraordinary corporate storytellers. He transformed product launches into an art form by following his three simple presentation principles “Ignite, Involve, and Entertain”. Remember, people get bored easily. Don’t give your audience time to get distracted. Create a deliver a narrative story. Describe a problem people experience with the current product choices to allow the audience to see you as a hero and your product as a great solution to their problem. Include demonstrations and video clips. Invite other speakers. Having planned and collected all the elements, create slides that should complement your story. And keep your presentations simple – a too complicated product description will not capture imagination of your prospective customers. “Steve Jobs spends hours rehearsing every facet of his presentation. Every slide is written like a piece of poetry, every presentation staged like a theatrical experience. Yes, Steve Jobs makes a presentation look effortless but that polish comes after hours and hours of grueling practice,” writes Carmine Gallo in his book The Presentation Secrets of Steve Jobs: How to be Insanely Great in Front of Any Audience.